Use as: • Antenna TV Tuner (Digital Antenna TV Receiver) • Digital Cable TV Tuner (Digital Cable TV Receiver) • Use Also As Digital TV Adapter (DTA) For Unencrypted Digital Cable to Analog Cable Typical Applications for External TV Tuners: • Monitor TV Tuner (Monitor TV Receiver) • Projector TV Tuner (Projector TV Receiver) • Home Theater TV Tuner (Home Theater TV Receiver) • Digital TV Tuner for HDTV Ready Analog TVs Package includes: 1* ATSC TV BOX Receiver. 1* Remote Control(Battery Not Including) 1* A/V RCA Cable 1* User Manual. ATSC NTIA and 8VSB Standard. Accessories USA TERRESTRIAL ATSC TV BOX 1. •Video output resolution: 480i/576i/480p/576p/720p/1080i/1080P. TUNER Rafael R836. Rear Panel Tuner RF input connector （Standard ISO/IEC 13818-1; ARIB STB-B10）. Features:Fully comply with DVB-T/T2 and H.264, MPEG-4, MPEG-2 Standard.The maximum speed of the traffic flow of at least 50Mbit / sec.Supports 3D interface.Supports Sleep Timer.Supports teletext / subtitle / multi-language.Powerful and highly effective 7-day EPG function.AUTO, 16:9 Pillar Box, 16:9 Pan G Scan, 4:3 Letter Box, 4:3 Pan G Scan, 4:3 Full, 16:9 Wide ScreenUSB 2.0 for PVR, TIMESHIFT, software upgrade and media files playback.Video output resolution: 480i / 576i / 480p / 576p / 720p / 1080i /1080P.Video Decoder: Compliant with: MPEG-4 part10 / MPEG-2 ISO / IEC 13818.MPEG-4 Simple/Main / Advanced Profile @ LEVEL3 (10Mbps).MPEG-2 Main Profile # Main Level (15Mbps).H.264 MP#L3 (10Mbps). H.264 HP L4.1(25Mbps).Audio Decoder: MPEG-1, MPEG-2 (Layer I/II),. Tuner RF input connector, IEC-162-2( Female). TUNER: Rafael R836. AUTO, 16:9 Pillar Box, 16:9 Pan G Scan, 4:3 Letter Box, 4:3 Pan G Scan, 4:3 Full, 16:9 Wide Screen. -Tuner RF Loop through connector, IEC-162-2( Male). 1 High Definition Digital Terrestrial Receiver. Note: The item does not support 1080P High Definition Videos with Dolby Sound effect.But it supports other 1080P High Definition Videos. Video output resolution: 480i / 576i / 480p / 576p / 720p / 1080i /1080P. 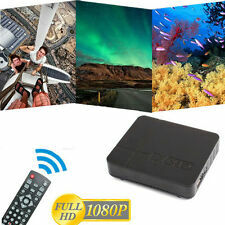 1080P ISDB-T Digital Terrestrial Convertor TV BOX Receiver PVR 5dBi Antenna. HD Definition Digital Terrestrial ISDB-T H.264 MPEG-4 SET TOP BOX 1080P Receiver. 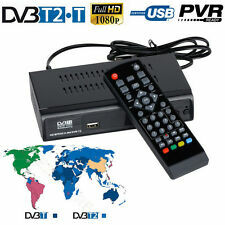 Full HD ISDB-T Definition Digital Terrestrial SET TOP BOX 1080P PVR USB Remote. Full compliance with DVB-T / T2 and H.264, MPEG-4, MPEG-2 standard. Video output resolution: 480i / 576i / 480p / 576p / 720p / 1080i / 1080P. The maximum speed of traffic flow is at least 50 Mbit / s.
Enjoy the pleasure with thisU2C TV digital receiver which features perfect performance and multi-functional operations. BT - 470 0.3mm Gravity Feed Dual Action Airbrush Paint Spray Gun Tattoo Nail New. DVB-T2 Mini Size HD TV Digital Terrestrial TV Tuner FTA RECEIVER CONVERTOR VHF UHF Antenna 1080P Set Top BOX HDMI Playback. FTA(Free To Air): Yes. Model Number: MinI DVB-T2. Type: Digital. Video Output: HDMI 1.4. Wireless: No. GOOGLE Cast: No. Weight: 0.8. Unit Type: piece. Ethernet: None. Item No. : TR-00006. Aspect ratio: 4:3, 16:9. 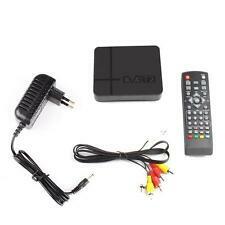 HD 1080P Digital DVB-T2 TV Set-top Box Terrestrial Receiver %Y*! B TV HDTV %Y*!